Water. We all need it. It’s essential for all life on earth, and cannabis plants are obviously no exception. Water is what your plant uses to transport energy through the stalk and your plant’s leaves will release water to help cool them down, much like human sweat. The quality and contents of your water will determine the overall success of your cannabis crop. So how do you make sure you’re giving your plants quality water? Consistency is important when it comes to growing cannabis, and due to its crucial, water is one of the things you will need to monitor and maintain. What a lot of new growers don’t think about is the type of water they are feeding their plants. Water is more than just a couple of hydrogen atoms attached to oxygen. Water contains any numerous natural minerals and sometimes added chemicals like chlorine which is used for treatment purposes. A grower should have a good idea of what exactly is in the water they are feeding their plants and what else their plants may need. From my experience, there are 4 popular sources for growing cannabis. I’m going to dive into each one and how it’s treated, as well as the pros and cons of each. 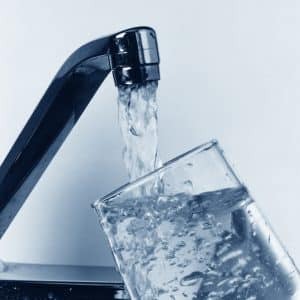 Reverse osmosis (sometimes called RO for short) is a method of water filtration that involves forcing water through a partially permeable membrane that removes ions, minerals, and larger particles. These filters strip the water of pretty much everything, leaving nearly pure water behind. These are the type of filters typically used by hydroponic growers. Hydroponic cannabis growers enjoy having this clean slate to work with. They start with stripped water and then add nutrients and adjust pH as needed to reach their ideal water composition. Using a product like Reefertilizer Grow and Bloom in RO water for a hydroponic or soil grow will help you maintain a proper balance of the essential nutrients for cannabis growth. 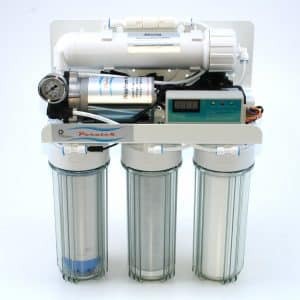 Reverseo osmosis and other membrane filters are usually more expensive than other methods. They also require a little maintenance as well since the filters need to be cleaned and replaced every so often. Good old tap water – it’s good enough for your house plants and, in most cases it’s good enough for your cannabis too! Tap water contains charged ions, minerals, and added chemicals like chlorine. Chlorine is an important part of tap water, making it safer by killing small organisms that can make us sick. Unfortunately, left-over chlorine can also hurt living organisms in soil, which has the potential to damage your cannabis growth. But there’s good news! Chlorine is volatile, meaning that it evaporates easily. Tap water isn’t good for hydroponics because the grower has no control over what type of minerals exist in the water, or at what concentrations. But if you’re growing a few plants in soil at home, tap water is perfectly acceptable. Just be sure to adjust the pH of the soil for cannabis to avoid any nutrient problems. Reefertilizer Grow and Bloom are easy to mix into tap water and make feeding your plants a breeze. Just measure the right amount of powder, shake it up, and feed your plants, simple as that. Bottled spring water is generally taken from a natural source and then filtered by any number of methods. 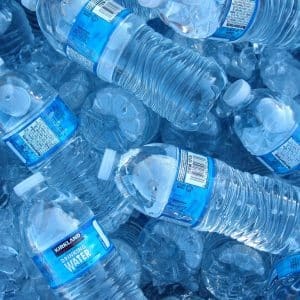 Most bottled water is essentially the same as tap water, with the same potential for unknown minerals, ions, and chemicals. Using spring water to feed your plants is expensive and doesn’t offer many benefits over tap water, and I don’t realy recommend it because of the overall cost, but wanted to mention it because I once had a friend who used it to feed his clones and seedlings. The only significant benefit I can think of is that bottled water usually has a consistent PPM value and pH. Distilled water is another expensive water source available as bottled water to give your plants. Similar to reverse osmosis, distilled water is stripped of ions, minerals and contaminants, offering a clean slate like RO water but with a potentially steep price tag. PPM stands for “parts per million”, it’s used as a measurement of the total dissolved solid within water. Using a filter will remove most of these solids and lower the overall PPM value of a liquid. It’s very popular to use a natural water source to feed cannabis plants. There are a few things you should know before giving swamp or lake water to your cannabis plants. At first it might seem like the natural way to feed any plant, but let’s think about how plants get water naturally. Plants get their water through rain and water in the soil. Rain is a lot like distilled water. Water evaporates from the earth leaving behind many minerals and contaminants. It then rains down on the soil, and filters through dirt while on it’s way to feed hungry plant roots. 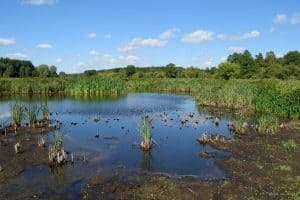 Water in the soil usually comes from a lake, river, or swamp. The soil acts as a filter and removes many large particles and organisms while enriching the water with a number of nutrients and minerals. Natural water sources contain many small organisms and potential pests to plant life. If you put it directly on your plants there’s a potential it might harm your plant or cause infection. If you do want to use a natural water source to water your plants, you should first filter it or boil it to remove any harmful contaminants. The mineral content of naturally sourced water is also difficult to predict and will depend on the geology and location of the water source. After filtering a natural water source you will want to add nutrients to feed your cannabis plant. Adding Reefertilizer Bloom or Grow will help ensure your plants are getting the essential nutrients needed for a great harvest. 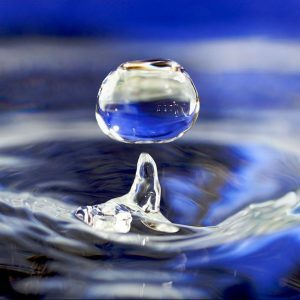 I hope this article helps clarify the different types and source of water available to feed your cannabis plants. These sources range in cost and benefits. Regardless cannabis will need the right combination of water and nutrients to grow healthy and potent flowers. 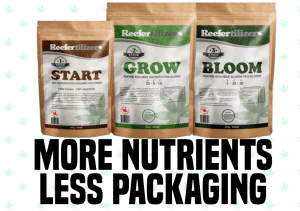 Reefertilizer nutrients contain all the essential nutrients for cannabis growth and can be used easily with each one of these water sources. 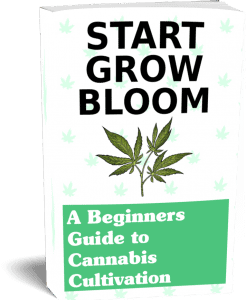 To learn more about growing cannabis at home, be sure to download our free guide. It contains basic and advanced information for getting started. To get your copy you can simply sign up for our free newsletter. Our newsletter will give you regular (but not too regular) updates on our blog and our products, keeping you in the loop on the best ways to grow cannabis at home. You can unsubscribe at any time if you’re not a newsletter kinda person, but I’ll be a little sad if you do. Thanks for reading! If you have any questions or comments, send us an email or fill in the comment box below. Grow good weed!